To order a printed copy of the Visit Southport brochure, simply click the Request button below. Southport has everything you could need in a holiday destination. Looking for accommodation? Choose from large hotels, boutique hotels, homely bed and breakfasts, quaint guesthouses, Southport has an abundance of them all. Looking for somewhere to eat? Find quality eating establishments across the town – whether its British, European or International cuisine, Southport has the lot. Check the events calendar to see what is happening whilst you are here and book tickets before you arrive, from music and food to flowers and fireworks, there is something to suit every taste. Or fancy a show? Check out the Southport Theatre, The Atkinson and many other establishments across the town hosting daytime and evening shows. Request the Visit Southport visitor guide today to start planning your visit! Visit Southport Brochure Paul B. said: Thankyou very much. 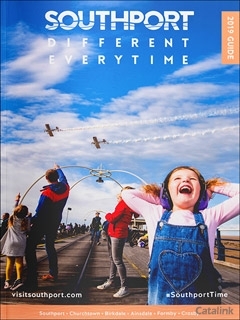 Visit Southport Brochure Wayne C. said: A well presented brochure depicting the vibrant life and interesting scenes in Southport. As soon as my finances are I order I am considering a booking! By pressing the Request Printed Brochure button you give consent to Visit Southport (and their Data Processors for the specific purpose of delivering your literature) to send you their Brochure .